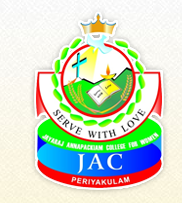 Jayaraj Annapackiam College for Women (Autonomous) (JAC), Periyakulam was established in 1971. The college was affiliated to Mother Teresa Womens University, Kodaikanal. The college was reaccredited with A Grade by NAAC and is a Christian Minority Institution. Jeyaraj Annapackiyam College for Women, Periyakulam offers various graduate courses as well as Post Graduate courses. Jeyaraj Annapackiyam College for Women, Periyakulam is affiliated to Mother Teresa Womens University, Kodaikanal. List of facilities available at Jeyaraj Annapackiyam College for Women, Periyakulam for students.